Today was the first day I noticed my garden’s red species tulips in bloom, although that doesn’t mean they didn’t bloom earlier. They’re small—about the size of a crocus—so easy to miss. Species tulips are different from the regular, large-blooming garden tulips cultivated over centuries by the Dutch and others. They’re called species tulips because each variety is, in fact, a separate species that also grows in the wild in their native habitats of Turkey, the Caucasus, and Central Asia. They’ve had minimal to no breeding to differentiate them from their wild ancestors. 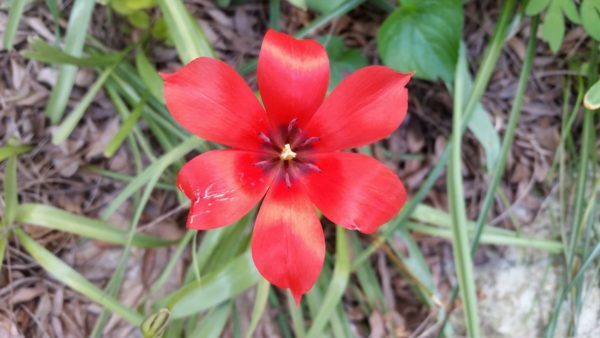 The one pictured above is an example of Tulipa linifolia from my garden.